Every January, the Incentive Research Foundation releases their IRF Trends Study to highlight some of the trends that are expected to affect the incentive industry in the coming year. 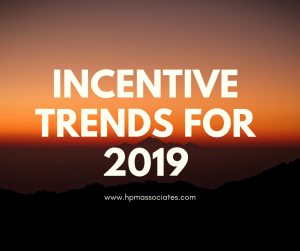 The organization put out their most recent 2019 study a few weeks ago and used it to point out 10 trends that they think will have an impact on the incentive industry over the next 12 months. Check out some trends they’re expecting to see take shape in the near future. Incentive travel has been something that many companies have offered to standout employees in recent years. It’s not a new concept. But more and more companies are expected to start offering incentive travel programs to employees this year. This is partly because many companies have expanded their budgets due to the success they’ve enjoyed in recent years, but it’s also partly because many CEOs and other top-level officials have seen first-hand just how beneficial incentive travel can be when it comes to rewarding and recognizing employees. Companies are sending employees to places like the Caribbean, Australia, Hawaii, and more with roughly 50 percent of incentive houses and 25 percent of corporations choosing to send employees to all-inclusive resorts. While incentive travel is going to be on the rise in 2019, roughly 80 percent of incentive travel program owners report that they plan on trying to find ways to cut the costs associated with sending their employees on trips. One of the ways they’re doing it is by trying to keep the cost of air travel down. They’re also turning to all-inclusive destinations more often than not as a way to reduce costs. About 40 percent of incentive travel buyers say that they’ve used all-inclusive resorts as part of a cost-saving strategy. Once upon a time, the only thing companies needed to do to entice employees to work hard was offer the possibility of incentive travel. But these days, people are traveling more than ever before with some studies suggesting that about 70 percent of millennials travel to a new destination once every year. With that in mind, many incentive travel planners are making it a point to create unique experiences when putting together incentive travel programs. And they’ll need to continue to take this approach to keep people motivated by incentive travel options. Keeping up with the latest incentive travel trends can be a real challenge, even for those who are constantly keeping tabs on them. HPM Associates can provide your company with the incentive travel services you need to keep your employees motivated. Call us at 305-274-0030 today to hear more about the services we have to offer!